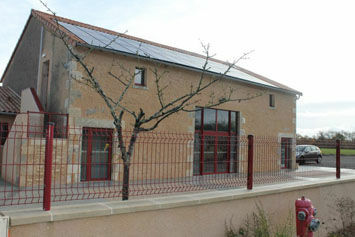 "Le Gîte du Roulier", located in the stables of an old brick factory and with the benefit of air-conditioning, has nine bedrooms (eight of which are upstairs) and can accommodate forty people. Its many facilities, such as children’s games, a petanque court and table football, make for an enjoyable stay. That little extra something: this is a secure and perfectly equipped cottage offering a harmonious group stay. There is no review about Gîte Du Roulier, be the first to leave one !